Winter landscape taken from behind railroad track. 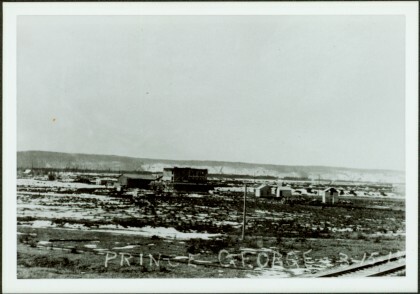 Cleared land in foreground, buildings in midground, low hills in background. Handwritten annotation on recto: “PRINCE GEORGE 3-15-14”. Item is part of the Prince George Historical Photograph Collection. Duplicate available, see item 2010.13.10. Stamped annotation on verso of photograph: "-8.3.70".